Learning to give a cat a bath may not be one of the skills you need often as a cat owner, but there may come a time when you need to help out with kitty hygeine. The key to a successful bathing experience for your kitty is preparation. Preparation will save both time and aggravation for you and your cat, especially if bathing isn't a normal part of your cat health care regimen. First of all, it is important to use cat-specific products on your pet. Dog or human products are inappropriate because cats can be quite sensitive to the chemicals used in those products. Your veterinarian can advise you on the proper shampoo. If your cat has a skin problem, a shampoo and perhaps a conditioner specific to your cat's condition will help give your cat relief from some of her symptoms. If your cat has scaling or flaky skin, she may have seborrhea. A cat shampoo made with sulfur or salicylic acid may provide an effective way to treat her condition. Consult your veterinarian for an appropriate product. One of the wisest things you can do before giving your cat a bath is to trim her claws both in the front, if she has them, and the back. Even the sweetest cat is likely to find a bath unnerving, especially if it is the first time she has had one. Save yourself from any unnecessary bloodshed prior to the bath. You may also want to comb your cat before her bath. Cats will lose great amounts of hair when placed in stressful situations, but brushing can help cut down on the amount of hair left on your drain screen. You can also work out any mats that may be present if you have a long-haired cat. A small room is ideal and one of the very first things to consider when learning how to give a cat a bath. Smaller is better. The foremost thing on your cat's mind will be escape. 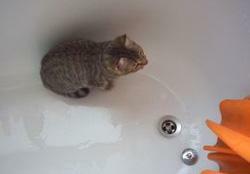 It is easier to finish the bath if you can find her easily and get her back in the sink or tub to finish. Mise en place is a guiding principle in the culinary world which means "everything in place" as in prior to beginning your recipe or in this case, beginning your adventure. You should have everything you need within easy reach, including the shampoo, conditioner and a towel. Ideally, the room should be warm to keep your cat more comfortable when she is out of the water. For your part, a surprise attack is best. After getting the room ready, you can scoop up your cat casually, trying not to alert her to anything coming ahead. If she bolts, don't force it. The last thing you want is an anxious cat in the sink. Assuming you have her in place, you can keep a towel around her and wet her thoroughly. The advantage of this method is that the towel helps hold her. You should use a cup to gently pour warm water over her body, taking care to avoid her face. Lather her up, gently massaging her skin. Again, pour water over her body while using your advantage of strength to keep her in place. Try to work quickly to minimize the time she must be restrained. Next, apply a conditioner, following the product's instructions for use. If she is a biter, you may want to consider muzzling her before you begin the bath. When the bath is finished, reach for your dry towel to blot off the excess water. The cat will likely want to bolt as quickly as possible. Do your best to dry her without agitating her more than necessary. When all is done, let her sit alone in the warmed room to groom and recover. Have an extra fluffy towel on the floor for her to rest on if she chooses. So that's how to give a cat a bath. Fortunately, you probably won't have to give your cat a bath unless she makes it necessary during an outdoor excursion or because of a skin condition. Just try to make the process as quick as possible while getting the job done and make the process easier for you and your cat.